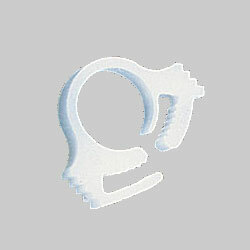 Hose Clamp: Plastic, White with diameter 0.228" (5.8mm) to 0.256" (6.5mm).Pack of 5. Once set, clamps stay put. To use, just position clamp on hose or tubing bundle and press the jaws together with a pair of pliers.